Aspiring Porsche junior drivers Jaxon Evans and Dylan O’Keeffe face a nervous two weeks as they await a decision from Germany on their future. Both Evans and O’Keeffe took part in the Porsche Shootout at Paul Ricard last week, and have both returned to Australia while a decision is made. Having competed in the Porsche Wilson Security Carrera Cup Australia in 2018, Evans won the series to book his place in the Shootout while O’Keeffe was offered a wildcard entry. The pair took part in the all-encompassing three day program which included full medicals, media, and an evaluation of their on-track performances over the final two days. They were joined by 10 other aspiring juniors from Porsche’s global competitions who are all in with a shot of being signed as next year’s junior driver. Wet weather dominated the track running, making head-to-head comparisons near impossible, though both Evans and O’Keeffe left Le Castellet happy with their performances. 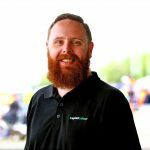 “It was interesting, there was a lot of champions from different Carrera Cups form around the world, so going into the event we were unsure how we would stack up,” Evans told Speedcafe.com. “I was happy with my performance, it’s obviously hard to compare – you don’t get to compare against anyone else that’s driving on the day apart from the current Porsche junior (Thomas Preining). O’Keeffe was equally satisfied with his performance, though like Evans was left without insight as to whether he impressed. “I think it was really good, if I had the chance to do it again I wouldn’t do it any differently,” O’Keeffe told Speedcafe.com. “When I was in the car I drove as well as I could have, always on the limit. Now back on home soil the duo face an anxious wait as the German marque comes to a decision, which is not expected until the end of next week at the earliest. “It’s an odd feeling,” Evans admitted. “I’m happy with my performance and felt like I put my best foot forward, so sitting around waiting for two weeks will be quite tough, but I’ll just try and keep busy and keep my mind off it. “I think either outcome will still be a very positive thing for me, the whole experience itself was amazing and a once in a lifetime opportunity. For O’Keeffe it’s the second time he’s been through the process, having received a wildcard call up to last year’s evaluation. “I remember last year they made it sound like you only get a phone call if you win, and I remember being at dinner with my mates, phone starts ringing and it says Stuttgart,” O’Keeffe recalled. “My heart started racing. I answered it and Jennifer, one of the top ladies from Porsche, and one of the other guys. “I remember taking that phone call and I was really nervous but they were just informing you what had gone on. “Obviously last year I didn’t win it but at least this year I know if the phone rings not to be too excited, just to be a bit more relaxed. With their future currently up in the air both have had to all but pause their preparations for next season, which could see them racing Supercup in Europe. Should Evans or O’Keeffe be named the winner of the Shootout they will receive a €225,000 scholarship towards a Porsche Supercup program for 2019. It would mark the second time in three years a Carrera Cup Australia competitor has won the Shootout, following Matt Campbell’s success in 2016.